Released: July 2, 2014. Directed by: Scott Derrickson. Starring: Eric Bana, Edgar Ramirez, Olivia Munn. Runtime: 118 min. Director Scott Derrickson brings the same eerie style to his latest film “Deliver Us From Evil” as he did with “Sinister”, even though this is the more basic of the two, without the same heart-pounding effectiveness. Early on, the scares rely heavily on creepy crawlies and scares from hyperactive animals. This choice for atmosphere doesn’t enable any ability to differentiate itself from “The Silence of the Lambs”, until it gets into the story. The competent mystery begins in Iraq with a small army group who find a cave with odd inscriptions. This leads to 1990s New York where the real-life Sergeant Ralph Sarchie resides. A passionate detective, Sarchie is deeply affected by the abuse of children – it is established early on. The mystery starts when a seemingly insane woman Jane (Olivia Horton) throws her two-year-old baby in the lion’s den at the local zoo. Sarchie is sent on an awry journey and first-hand encounters with malicious evil, and makes him want to find out why a woman with no previous criminal record just lost her mind. Basic horror film scares can be found in this film: creepy crawlies, strange noises from the basement, weird static, children’s laughter, and children’s toys that come to life. Latin inscriptions might make you expect a basic exorcism film and the long-run, and that’s what is delivered. Some aspects of the mystery are intriguing, particularly the repetition of lyrics from a song by The Doors (“Shut the door, the damn door”). The film, running nearly two hours, is too long for something this basic and something that delivers only a few intense sequences and a creepy atmosphere. What does set this apart is a sensitive performance from Eric Bana; as he truly captures the essence of Sarchie, who cares deeply for others, even if he is not the best at showing it. By being so dedicated to his community, he neglects to spend time with his family (Olivia Munn isn’t notable as his wife). This is an enjoyable aspect. This is a movie that’s about how people can be affected by secondary evil, and the effects it has on them. Sarchie has been deeply impacted by this kind-of evil, but is now experiencing a whole other type of evil, a primary evil that sometimes can’t be explained. Many of these concepts are brought up by a priest named Mendova (Edgar Ramirez), a heroin addict who found God. One good thing about this film: This is Joel McHale’s first truly enjoyable film role. He’s been playing jerks since his days of TV’s “Community” and that’s the only place it has previously been effective. This time he plays a mildly likeable character, and perhaps action or horror films might be his calling in the movies. Released: August 8, 2014. Directed by: Lasse Hallströme. Starring: Helen Mirren, Om Puri, Manish Dayal. Runtime: 122 min. 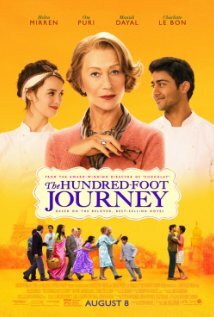 Lasse Hallströme helms another adaptation (his follow-up to the awfully silly “Safe Haven”), this time written by Steven Knight (“Eastern Promises”) and adapted from The Hundred-Foot Journey by Richard C. Morais; a novel about cooking, not walking. It follows the Kadam family, who move to France from India to both start anew (especially after the main character’s mother dies) and escape local political violence. Hassan (Manish Dayal) is the main protagonist who has a passion for food. He and his family open up a traditional Indian restaurant next door to Madame Mallory’s (Helen Mirren) French cuisine restaurant that has received one out of a three possible Michelin stars from the annual Michelin Guidebook. Officially, the guidebook says that it has “exceptional cuisine, worth a special journey.” This leads me to believe the film’s title has a dual meaning – saying that Mallory’s restaurant is worth the journey to eat at; and the main meaning is that the Kadam family opens their restaurant one-hundred feet away from hers. As if the struggles of opening an Indian restaurant in France were not difficult enough. Mirren is good as Mallory, and it’s interesting to see her relax throughout the film. Also good is Om Puri as Hassan’s grandfather, whose stubborn nature brings humour to the lightly entertaining film – especially matched against Mallory’s stubborn nature. The stand-out is the young Manish Dayal who plays the passionate cook who doesn’t believe recipes necessarily have to stay the same.